Welcome to Tripshelf.com. The domain name www.Tripshelf.com is owned and operated by Tripshelf Technologies Private Limited a company incorporated under the Companies Act, 2013 (hereinafter referred to as "Tripshelf" or “TS”). TRIPSHELF IS AN ONLINE MARKETPLACE FACILITATING PURCHASE AND SALE CONTRACTS RELATING TO TRAVEL PACKAGES BETWEEN USERS ON THE SITE (“TRAVEL CONTRACTS”). TRIPSHELF IS NOT THE PROVIDER OF ANY TRAVEL PACKAGES AND ASSUMES NO OBLIGATIONS OR LIABILITY AND OFFERS NO INDEMNIFICATION FOR THE CORRECTNESS OF INFORMATION DISPLAYED BY USERS ON THE SITE, QUALITY OF SERVICES RENDERED BY USERS TO EACH OTHER, SUCCESSFUL PROVISION OF SERVICES AND COMPLETION OF CONTRACTS BETWEEN USERS, OR ANY OTHER MATTER CONNECTED WITH SERVICES OFFERED BY AND TRANSACTIONS ENTERED INTO BY OR BETWEEN USERS OF THE SITE AND SERVICES. THE FOLLOWING DIAGRAM DEMONSTRATES OUR OFFERING. By making use of this site, and furnishing your personal / contact details, you hereby agree that you are interested in availing and purchasing the Service(s) that you have selected. You hereby agree that Tripshelf and / or Sellers may contact you either electronically or through phone, to understand your interest in the selected products and Service(s) (like information, verification, offers, renewals, reminders etc.) and to fulfill your demand. You also agree that Tripshelf reserves the right to make your details available to its affiliates and partners and you may be contacted by the affiliates and partners for information and for sales through email, telephone and/or sms. You agree to receive promotional materials and/or special offers from Tripshelf through email or sms. Your use of the Site is entirely at your own risk, for which Tripshelf shall not be liable. It shall be your own responsibility to ensure that any products, services or information available through the Site meet your specific requirements. From time to time the Site may also include links to other websites. These links are provided for your convenience to provide further information. They do not signify that Tripshelf endorse the website(s). We have no responsibility for the content of the linked website(s). Tripshelf hereby expressly disclaims any implied warranties imputed by the laws of any jurisdiction or country other than those in India. Tripshelf considers itself and intends to be subject to the jurisdiction only of the courts of NCR of Delhi, India. You agree and acknowledge that Tripshelf will have the right of indemnification for any loss that may be caused to Tripshelf for any misuse of the Site by You, and Tripshelf will have all rights to approach any court of law for enforcement of such rights. Tripshelf or its affiliate partners will not be liable for any Visa rejections and Hotel cancellation policies would still stand as they are. The Site is a platform that Users utilize to meet and interact with one another for entering into Travel Contracts. Tripshelf is not and cannot be a party to or control in any manner any Travel Contracts between the Site’s Users. All commercial/contractual terms are offered by and agreed to between Buyers (travelers) and Sellers (travel agents) alone. The commercial/contractual terms include without limitation price, payment methods, payment terms, date, cancellation, period and mode of delivery, warranties related to products and services and after sales services related to products and services. Tripshelf does not have any control or does not determine or advise or in any way involve itself in the offering or acceptance of such commercial/contractual terms between the Buyers and Sellers. You acknowledge that through this Site, Tripshelf merely provides a platform which enables you to have access to various travel services offered by the Sellers. It is agreed that the contract for sale of any of the products or services shall be a strictly bipartite contract between the Seller and the Buyer. Tripshelf (including its directors, officers, employees, agents and their respective successors, heirs and assigns) shall not be or deemed to be responsible or liable for any direct, indirect, punitive, incidental, special, or consequential damages arising out of, or in any way connected with, your access to, display of or use of this Site or for any lack or deficiency of services provided by any person (including any airline, travel agent / tour operator, hotel, facility or similar agency) you shall engage or hire or appoint pursuant to or resulting from, the material available on the Site. Tripshelf does not make any representation or warranty as to the item-specifics (such as legal title, creditworthiness, identity, etc) of any of its Users. You are advised to independently verify the bona fides of any particular User that You choose to deal with on the Site and use Your best judgment in that behalf. Tripshelf shall not be liable for delays or inabilities in performance or non-performance in whole or in part of its obligations due to any causes that are not due to its acts or omissions and are beyond its reasonable control, such as acts of God, fire, strikes, embargo, acts of government, acts of terrorism or other similar causes, problems at airlines, rails, buses, hotels or transporters end. In such event, the user affected will be promptly given notice as the situation permits. Tripshelf is a communication and marketing platform used by tour operators / sellers / travel agents to market their packages and offers to website visitors / users who may at their discretion and best judgement choose to buy / book / reserve / inquire about an offer. Tripshelf may also further communicate this offer over email / phone / in-person and in doing so is not creating any principal agent relationship but merely communicating the different offers available. The delivery of services is controlled by the tour operator / seller and Tripshelf does not guarantee delivery or quality of delivery. (ii) serving as the limited payment collection agent of each tour operator for the purpose of accepting payments from Users on behalf of the tour operator. Tripshelf cannot and does not control the content contained in any listings put on the Site by a tour operator / travel agent. Therefore, Tripshelf is not responsible for and disclaims any and all liability related to any and all listings. Accordingly, any bookings will be made at the User’s own risk. These services are accessible on the Site and any other websites through which Tripshelf makes the services available and as an application for mobile devices. Users can use the Site to book packages that are being offered by operators on the Site. Operators are required to agree to the terms and conditions listed in the Operator Terms and Conditions before providing services on the Site. Because Tripshelf does not control interactions among between Users and packages or other persons or companies, and because Tripshelf cannot guarantee the true identity, age, nationality of Service users, and because Tripshelf has limited control, if any, over the quality, safety, morality, legality, truthfulness or accuracy of various aspects of the Service you agree that you bear all risk and you agree to release us (and our officers, directors, shareholders, agents, employees, affiliates, subsidiaries, and third party partners) from claims, demands, and damages (actual and consequential) of every kind and nature, known and unknown, suspected and unsuspected, disclosed and undisclosed, now and in the future, arising out of or in any way connected with your use of the Service, your Third Party Transactions, and/or our resolution of any disputes among users. You further waive any and all rights and benefits otherwise conferred by any statutory or non-statutory law of any jurisdiction that would purport to limit the scope of a release or waiver. You warrant that the packages offered by you on the Site are legitimate, within the scope of all Indian and other local and international applicable law, and that all of the offers and contents laid down by you with respect to your packages are true in all respects. Tripshelf shall not be liable to independently verify/certify any information offered by you on the Site. You agree to exclusively use Tripshelf and the Site for the purposes of offering these packages and agree not to, under any circumstances, solicit in any manner, Users of the Site and offer packages to them outside the usage terms and contractual arrangements of the Site. In the event that Tripshelf determines that channels other than those offered by it on the Site are used to solicit Users and offer Packages, such Operator's account may be immediately cancelled. You hereby agree to bear any and all costs and damages associated with such non-contractual solicitation outside the terms of the Site. Operators must carry and present to the User booking a package an original, authorised, Government issued Proof of Identity (such as Driver’s License, Voter ID Card or Passport) if requested for by Tripshelf or the User. In the event that the package is not delivered fully i.e. services as promised in the package are not delivered, by the operator upon the Booking of the package, Tripshelf reserves the right to, inter alia, unilaterally cancel the Package, forfeit the fee payable to such operator for the package and penalise the operator for quantifiable damages for reimbursement of all costs associated with such package and related costs. Repeated mis-delivery by operators may also lead to a unilateral cancellation and expulsion of such operator from the Site without prior notice. In the event of a claim or dispute raised by a User booking a package with regard to such package, Tripshelf reserves the right to withhold the payment payable to the operator till such reasonable time as it may take for Tripshelf to verify such claim or dispute as the case may be, and if on the basis of facts and evidence perused by Tripshelf it is found that the claim or dispute raised by such User is valid, Tripshelf reserves the right to forfeit the fee payable to such operator for the package and penalise the operator for quantifiable damages for reimbursement of all costs associated with such package. Repeated claims and disputes againstoperator may also lead to a unilateral cancellation and expulsion of such Operator from the Site without prior notice. Operator agree that the packages offered by them on the Site are contracts entered into by them with Users as independent contractors and in no event shall there be a partnership, employment or agency relationship between the operator and Tripshelf/the Site. The Site shall act exclusively as a medium and aggregator for operators and Users to interact at their own risk and liability. All liability for contracting with a User and conducting a package vests exclusively and at all times, with the operator. In no event shall Tripshelf be liable for any costs, damages, injury or claims associated with your booking/conducting a package offered on the Site or shared with Tripshelf via mail / any written communication. 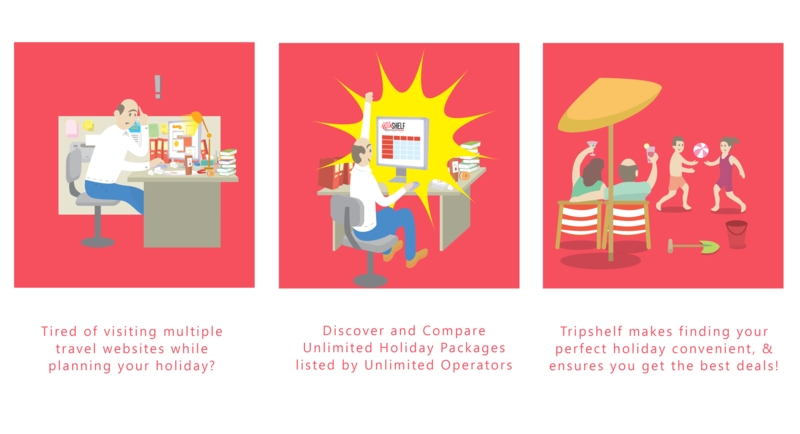 To facilitate in booking a package, Tripshelf has created a software solution called TripPay. A tour operator will first create a payment request and list down the package elements and cancellation policies provided against the payment request and whether the payment request is an advance or full payment. If satisfactory, the user may choose to pay the amount. Once the amount is paid, the amount rests with Tripshelf until such time that the tour operator does not send the user the required voucher / receipt as agreed upon in the payment request. The user has the right to review the voucher / receipt and accept or reject the same. In the event the user rejects the voucher, subject to clarification with the customer, the amount is refundable. Following the user's acceptance, Tripshelf will release the payment to the tour operator. User agrees to abide by the tour operator's cancellation policy and refund policy once the vouchers are approved. Tripshelf will not release any payment to the tour operator without the user's explicit acceptance which is an OTP validated process. The above is the payment guarantee that Tripshelf provides. Payment guarantee in no way guarantees the trip / experience / services / validity of the package or offer. TripPay is a solution created to facilitate the payment and validation of vouchers / receipt, and is not a guarantee of holiday package services. A user must use their own discretion to engage in the contract with a seller on the site. Any references in the Site to an operator or a User being “verified” (or similar language) only indicate that the Operator / User has completed a relevant verification process, and does not represent anything else. Any such description is not an endorsement, certification or guarantee by Tripshelf about any Operator / User, including of the Operator's / User’s identity and whether the Operator / User is trustworthy, safe or suitable. Instead, any such description is intended to be useful information for you to evaluate when you make your own decisions about the identity and suitability of others whom you contact or interact with via the Site. We therefore recommend that you always exercise due diligence and care when deciding to book a package or hosting a User. In certain instances, Tripshelf may offer its Users the facility of cancelling bookings related to Travel Contracts through its platform. Tripshelf makes no guarantees expressly or impliedly, and assumes no liability in relation to the facilitation of such cancellations. Any cancellation of bookings shall have to be done 48 hours in advance of the date of the scheduled package by written communication to - Info@tripshelf.com with subject line starting with - "CANCELLATION". In the event of no show by the User, Tripshelf reserves the right to forfeit the booking amount without any prior intimation. Refunds on cancellations of a Package made prior to the day of scheduled package, as listed in User’s e-mail confirmation, will be subject to additional terms and conditions related to the specific package. These additional terms and conditions may vary from each package. Tripshelf shall not be held responsible for any delay, deviation, or cancellation of the package due to weather conditions. No package may be cancelled or changed by you at anytime on the basis of weather conditions. Tripshelf is not liable for any refund of booking amount in case of such cancellation. Tripshelf shall not be held responsible for delays due to traffic conditions, labour disputes (including strikes that are previously announced or spontaneous), border problems or other political or economic factors. Tripshelf shall not be liable for any refund of booking amount in case of cancellation for such reason. Tripshelf shall not be held responsible for delays due to mechanical / technical failure, or other issues that may arise and are outside our control. Tripshelf shall not be held responsible for delays or cancellations due to hostile political environments or other issues that may arise due to this and are outside our control. Tripshelf at any time may deem it unsafe for Packages to carried out by Operators in various destinations due to political unrest and may not be held responsible for these cancellations. Tripshelf shall not be liable for any refund of booking amount in case of cancellation for such reason. THE OPERATORS REFERENCED THROUGH THE SITE ARE INDEPENDENT SERVICE PROVIDERS AND ARE NOT AGENTS, SERVANTS OR EMPLOYEES OF TRIPSHELF. TRIPSHELF IS NOT LIABLE FOR THE ACTS, ERRORS, OMISSIONS, REPRESENTATIONS, WARRANTIES, BREACHES OR NEGLIGENCE OF THE OPERATORS OR FROM ANY PERSONAL INJURIES, DEATH, PROPERTY DAMAGE, OR OTHER DAMAGES OR EXPENSES RESULTING THEREFROM. TRIPSHELF’S LIABILITY FOR ANY SERVICES OFFERED BY IT WILL IN ALL INSTANCES BE LIMITED TO THE TRANSACTION FEE CHARGED BY IT FROM USERS. Please send any questions or comments (including all inquiries related to copyright / trademark infringement) regarding this Site to info@tripshelf.com. Cashbacks offered by Tripshelf are credited to your "Tripshelf Account" and can be used on Tripshelf.com for booking travel packages. Cashback can be used at INR 500 per person at any time. To explain - if you have INR 2500 in your Tripshelf Account and are booking for 5 persons you may use INR 500 per person as cash discount against the booking amount. Hence INR 2500 in full can be used. Cashback offered is always per twin booking - i.e. - booking of package for 2 persons minimum. Here's a traveller friendly cancellation policy for short trips where Tripshelf is the seller for all bookings that are less than 5 persons. For bookings more than 5 persons, the trips are non refundable. Payment schedule - Full payment to hit Tripshelf as per individual trip requirement. If not mentioned in trip itinerary then minimum 20 days in advance the full payment must reach Tripshelf. Amount is defined as the package price negotiated less flight / ship / car / volvo / bus / train charges. If flight / ship / car / volvo / bus / train are included in package then cancellation policy is as per discretion of tour operator / Tripshelf depending on the sector. On package cancellation, individual service elements are not provided in lieu of amounts paid. Tripshelf / tour operator need not provide any vouchers of services booked in liue of amounts paid. Cancellation - Please write to info@tripshelf.com with your payment id and cancellation request with subject starting with "CANCELLATION". No amount refundable for long weekend / special weekend trips such as Independence Day, Janmasthami, October 2nd, New Year's Eve, Christmast, Republic Day, Holi, etc. Offer valid from 15th October 2018 to 15th November 2018. The closing date can be extended at the sole discretion of Tripshelf Technologies Pvt Ltd.
On completion of every holiday package booking made by a consumer with a travel agent advertising on Tripshelf Technologies Pvt Ltd for a Diwali holiday package as labeled in the Diwali Sale the consumer will be awarded a scratch to win id. Consumer can use the scratch to win id to visit the Tripshelf Technologies Pvt Ltd website to claim the scratch to win offer. Consumer must email the vouchers received from the travel agent to Tripshelf Technologies Pvt Ltd and Tripshelf Technologies Pvt Ltd will issue the scratch voucher id for online redemption only after cross verifying with the travel agent. A scratch voucher id will only be issued on the purchase of a holiday package for minimum 2 persons for travel upto March 31st 2019. Minimum value of the holiday package booked should be INR 10,000. Offer valid for every booking upto 500 bookings of holiday packages for minimum 2 persons. One offer per booking of minimum 2 persons. In case there is a larger group one may split the group into 2. Individual contact details and invoices are mandatory. On purchase of a holiday package as per the above conditions, the customer will be given a scratch card. The customer will be entitled for a price-off or reward as indicated on the card. The customer stands a chance of winning goods upto to Rs 50,000 off after scratching the card. Redemptions can be done once the customer’s travel is complete as per the holiday package booked without any reduction in booking value. The selection of prizes in the scratch card is randomized. Tripshelf Technologies Pvt Ltd shall not be liable for any loss or damage whatsoever including but not limited to any consequential damages that may be suffered, or for any personal injury that may be suffered, arising out of this scheme or otherwise. For any goods or services that are won via the Diwali Dhamaka sale, Tripshelf Technologies Pvt Ltd shall not be liable for any loss or damage whatsoever including but not limited to any consequential damages that may be suffered, or for any personal injury that may be suffered, arising out of use of such products. You may contact the manufacturer of such products to take your claim forward. Using these products is at your sole discretion and choice. In the event a product is not working please contact the manufacturer as per the warranty offered by the manufacturer to take your claim forward. This Offer is not valid for employees of Tripshelf Technologies Pvt Ltd or the Travel Agents and Tour Operators and their employees, partners, affiliates, and vendors. The parties hereto agree that all disputes related to this offer shall be subject to the jurisdiction of New Delhi courts. Tripshelf Technologies Pvt Ltd is not responsible for any late, lost or stolen coupons. Tripshelf Technologies Pvt Ltd shall not be responsible for any cost, expense or other liability whatsoever in relation to, arising from, or connected with the benefits. Tripshelf Technologies Pvt Ltd reserves the right to modify, cancel, extend, or discontinue the scheme or any part thereof without giving any reason or prior notice. The customer copy of the email or SMS communication must be submitted at the time of claiming the prize won in the scratch card. The Customer shall be bound by the terms and conditions of this scheme. The decision of Tripshelf Technologies Pvt Ltd is final and binding. The Customer must send their invoice copy to the given address after being informed that he / she is the winner, failing which the customer may not be gratified. This offer shall be subject to laws of India, including tax regulations, as may be applicable to the customers. This scheme is applicable solely in India upto where the goods and services won can be delivered by online e-commerce companies Amazon.in and Flipkart.com. In the event the said goods cannot be delivered by the above companies at the normal cost of delivery, the customer may make alternate arrangements to pick up the same from New Delhi.